Mumbai, Nov 8: The Shiv Sena said on Sunday that Prime Minister Narendra Modi must take responsibility for the BJP combine’s defeat in the Bihar assembly election. After saying that Bihar Chief Minister and JD-U leader Nitish Kumar had emerged as “a political hero” after leading his alliance to a victory, he said it was time for Modi to accept responsibility. “This is a big win for Nitish Kumar. 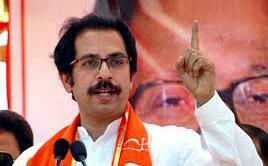 He has emerged as a political hero,” Sena’s Sanjay Raut told the media. “When Congress loses, then it’s (president) Sonia’s (Gandhi) responsibility. Similarly, BJP must accept that Bihar results is Modi’s responsibility,” Raut said.